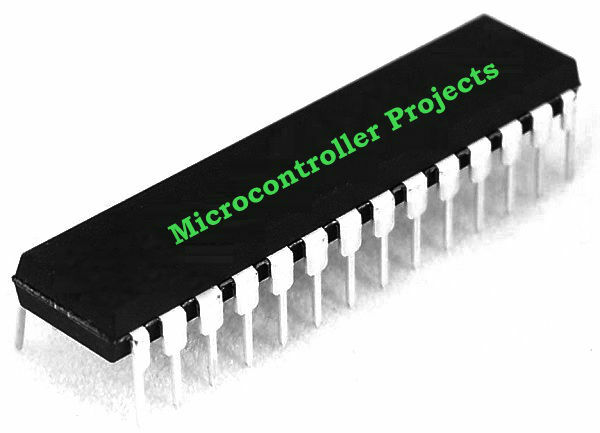 Nowadays microcontroller projects have become very popular and widely implemented as academic projects by most of the students. These projects are low-cost projects that provide a good practical knowledge to the students. Keeping their cost-effectiveness in view, the projects given in this article are based on data transfer between two or more microcontrollers that use wireless communications like IR and Zigbee communications. The main aim of this project is to transfer data efficiently between two microcontrollers by using IR communication. For transferring data, IR communication is implemented in this project, which is portable and less complex. The IR module consists of both transmitter and receiver sections that are displaced apart within the range, which can be extendable based on frequency adjustments. The IR is widely used for effective and short distance wireless communication. Two microcontrollers used in this project share the data with each other. In both the transmitter and receiver circuits, a power supply block drives the entire circuits. In the transmitter section, an AT keypad is used for entering the data that needs to be transmitted to other micro controller. 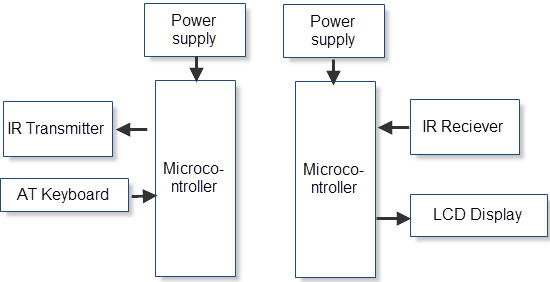 The microcontroller is programmed in such a way that it transfers the data entered from the AT keypad to the IR transmitter, as shown in the above figure. With the help of this system, the data can be easily transferred from one point to another. Like the above project, this system also transfers the data, but the type of transferring is different as it is done by using Zigbee. The Zigbee module here comprises both transmitter and receiver parts that act as a medium for transferring the data. The Zigbee is a low cost, low power, and secure data transfer communication, which is suitable for any microcontroller. The Antennas are used as interconnectors to receive the signals from the Zigbee transceivers. The sensing values such as temperature, switch status, battery voltages are given as an input to the microcontrollers. 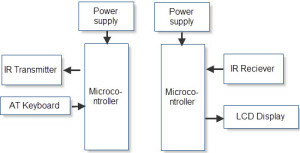 The microcontrollers process this data and transfer it to the Zigbee transmitter module. The Zigbee receiver receives the data, and the data is carried forward to other microcontroller, and finally transferred to the personal computer by using serial communication cable. This data can also be shared with other PCs by using TCP/IP cable. The project is designed by using multiple microcontrollers connected as a network to share the data that must be redundant in nature. Industrial sectors use this application to control their processes. 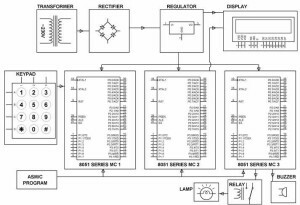 The system achieves accuracy of data by using three microcontrollers so that if any one of them is failed to do the task, the others will remain in a working condition, but do not take any action. This project comprises three micro controllers: one is connected to the keypad, the second one is connected to the LCD display, and the third one is connected to a relay and buzzer. In the first microcontroller a password is entered and data is transferred to the second microcontroller, which is then displayed on the LCD. 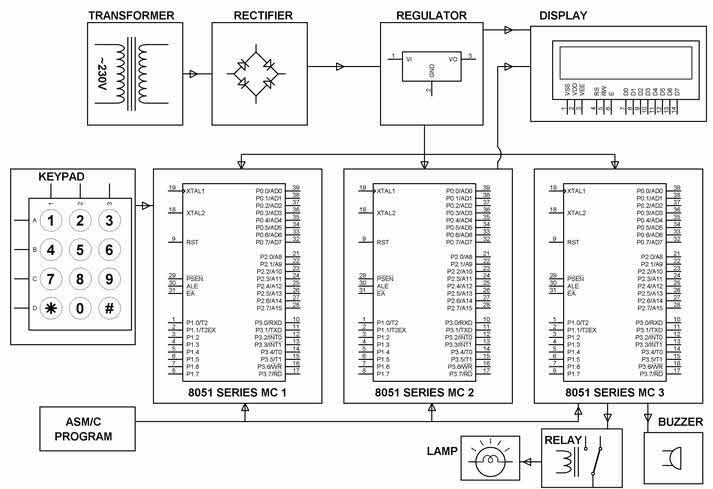 If the password entered is wrong, then the third microcontroller will turn the buzzer, or else it will turn the relay. This project can be implemented if there is some distance between the task areas so that the serial communication shares the data among these microcontrollers that are assigned for some particular tasks. This can also be achieved by wireless communication if there is a large distance between these tasks. This is all about the data sharing between various microcontrollers by using wireless and wired communications. Hope you have received enough information about these microcontroller based projects. For further assistance regarding these projects, you can click on edgefxkits.com, and if you want to comment, then the comments section is given below for you. I want more details regarding the project.I have opted the same topic for my academic project and i have worked for 3 months on the same with different methodology but its not helping me.please help me regarding the same as soon as possible as i am left with only a couple of days. I want information related to Zigbee ,like how it acts as a only transmitter and only receiver.so if possible help me. It acts like both Transmitter and also Receiver. You can download project abstract and seminar presentation also from the links. Please check the website for complete details in the kit content section and go through the FAQ for details .